Palestine on Friday became a formal party to five global treaties banning torture and racial discrimination, and protecting the rights of women, children and the disabled, the UN said. Rupert Colville, spokesman for the UN human rights office, told reporters that the move followed the Palestinians' April 2 declaration to UN Secretary General Ban Ki-moon that they were adopting the treaties. In addition, Palestine will on May 7 become party to an accord protecting children in conflict zones -- which is an optional part of the overall child rights treaty -- and on July 2 it will adopt two agreements governing civil, political, economic, social and cultural rights. "This accession to seven core human rights treaties and a key protocol is a significant step towards enhancing the promotion and protection of human rights in Palestine," Coville told reporters. "It is notable in a region with a high number of reservations to human rights treaties, that Palestine is acceding to eight human rights treaties without making a single reservation," he added. In the face of fierce Israeli opposition, Palestine won observer status at the United Nations in November 2012, opening the way for it to adopt a host of international accords. The PLO had pledged to freeze all moves to seek membership in UN organizations and international conventions during peace the talks in return for Israel's release of veteran Palestinian prisoners. In addition to the UN treaties, the PLO has also signed up formally to the Geneva Conventions, which set down the rules of warfare and humanitarian operations in conflict zones. The PLO also submitted requests to the United Nations to adopt accords including the Vienna Convention on diplomatic relations, and an anti-corruption agreement. Palestinian Authority president Mahmoud Abbas is expected to meet political bureau chairman of Hamas Khaled Mishaal and the Emir of Qatar Sheikh Tamim Bin Hamad in Doha next Sunday, press reports said. Jordanian daily Al-Rai said in an article on Thursday that Abbas is slated to visit Qatar to attend wedding of his grandson and would take advantage of the visit to meet with Mishaal and Hamad. The paper quoted sources in Fatah faction as saying that Abbas, who is also the Fatah leader, would discuss the consequences of the Shati Declaration on Palestinian reconciliation with both Mishaal and Hamad. They said that the discussion would focus on the Israeli penalties against the PA for concluding the reconciliation with Hamas and on a possible Qatari political and financial support for the reconciliation process. 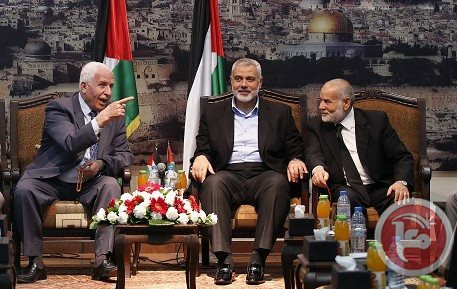 Hamas had signed an agreement with the Palestine Liberation Organization (Fatah is its major component) last Wednesday that ended seven years of division in the Palestinian political arena. 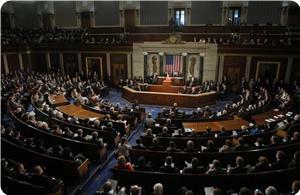 The US and Israel categorically refused the agreement. Two Republican congressmen called on the White House to sever all financial support for any Palestinian unity government to be formed if it does not acknowledge Israeli’s right to exist. Congressmen Marco Rubio and Mark Kirk said in a letter they sent last night to US secretary of state John Kerry that Hamas has to dismantle its armed wing and refrains from inciting against the US and Israel if it wanted to be part of the political process. The Palestinian reconciliation agreement signed on April 23 between the Palestinian liberation organization (PLO) and Hamas raised the ire of the US administration, which hastened to declare its opposition of any formation of a government that includes Hamas. Israel also threatened to impose economic sanctions on the Palestinian authority if it decided to go down the road with its deal with Hamas. Dr. Hanan Ashrawi of the PLO Executive Committee called on the international community and, in particular, the European Union to continue in upgrading its relations with Palestine, and its recognition of the State of Palestine, as well as in curbing the Israel's persistent violations and unilateral measures. 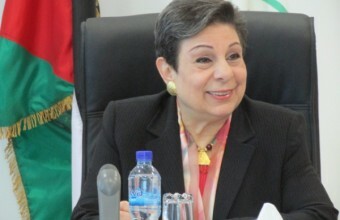 Ashrawi stressed, "We will pursue reconciliation seriously in the same way as we will implement our obligations under international law and the conventions to which we have acceded, and develop further steps according to our needs in compliance with our plans." During a meeting with representatives from the EU, UN and the PLO, parties discussed the latest political developments in Palestine, including the reconciliation agreement signed between Fateh and Hamas, Israel's illegal violations against the Palestinian people, the importance of the European role in bringing an end to the illegal occupation -- particularly its illegal settlement activity -- apartheid walls, home demolitions, the revocation of the residency status of thousands of Palestinians living in Jerusalem, the abuse and torture of Palestinian prisoners and detainees, the annexation of land in Area C, its continued siege and blockade of the Gaza Strip, and the isolation of Jerusalem from its Palestinian environs, the Palestinian News Network has reported. The meeting also covered Palestine's recent joinup with a number of multilateral treaties and conventions, as well as one UN organization. 8- The 2006 Convention on the Rights of Persons with Disabilities. 6- 1907 Hague Convention on the Laws and Customs of War on Land. 2- 1985 Convention on the Prevention and Punishment of the Crime of Apartheid. The importance of these conventions lies in that it will reiterating the international legal obligation of the Israeli authorities to respect the laws of war, in particular the Fourth Geneva Convention and Protocol I and the Hague Convention on the Laws and Customs of War on Land, which set obligations on the occupying power to protect civilians in the case of armed conflicts and prohibit attacking or transferring them or establishing settlements considering them as war crimes. At the same time, these conventions set an obligation on all the member States to work on ensuring the application of this convention in all circumstances. Accessions to the above-mentioned human rights conventions reflect the Palestinian Authority's commitment to guarantee respect and protection of human rights in the occupied Palestinian territory (oPt), as the majority of these rights are prescribed in the Palestinian Basic Law 2003. PCHR hopes these accessions will promote the mechanisms to protect the Palestinian people's rights against the PA's violations. 5- The Optional Protocol to the Convention against Torture 2002, which offers international and practical mechanisms to confirm the application of this Convention. Since last week's reconciliation agreement between Fatah and the Islamic liberation group, Hamas, Israel has been behaving visibly hysterically. Israeli Prime Minister Binyamin Netanyahu, a man who accords little regard to truth, made a plethora of hyperbolic statements about the "mortal danger" Israel is allegedly facing as a result of the reconciliation agreement. Ignoring Israel's theft of Palestine and unceasing efforts to destroy its native inhabitants, the Palestinian people, Netanyahu invoked the "holocaust" anew, claiming Hamas would inflict "another holocaust" on Jews. Ephraim Halevy, another Zionist supremacist wrote in Yedeot Ahronot on 1 May that the time was opportune for Israel to destroy Hamas. A thorough examination of Halevy's words leaves little doubt as to the striking similarity between Israeli and Nazi thinking. Israel is already starving and tormenting 1.6 million Gazans, denying them food, clean water, and other necessities of life. This is consistent with Zionist-Jewish thinking which views non-Jews as sub-humans or even animals. This is not mendacious propaganda that is meant to malign Jews and besmirch their good name. It is rather a fact of life uttered very often by the sages of the Talmud, such as the late Ovadia Yosef, the former spiritual leader of Shas. It is also practiced by Jewish terrorists almost on a daily basis against helpless Palestinians in both the 1948 and 1967 occupied territories. I know that western especially American media can't publish or broadcast these very real facts about Israel and Jews for fear of being accused of being anti-Semitic. Obviously, the Jewish-Zionist colonization of the collective American mind is too deep to disappear in a few years or even a few decades. Even high-ranking American officials such as Secretary of State John Kerry are often forced to retract honest statements perceived as somewhat critical of Israel. Hence, it is nearly impossible to count on the United States to succeed in reaching a genuine peace agreement in the Middle East, especially one that would end decades of Israeli military occupation of Palestinian territories. In the final analysis, ending the Israeli occupation of the West Bank, East Jerusalem and the Gaza Strip and repatriating millions of Palestinian refugees back to their ancestral land cannot be achieved without exerting meaningful American pressure on Israel. Obviously, the U.S., as it stands today, can't do this, thanks to the Jewish-Zionist stranglehold on American political life. It can also be safely argued that the American government is unlikely to be able to play this role for several decades to come due to the same factor. In addition to the recalcitrant remarks and bellicose threats, the Israeli government has threatened to cut the transfer to the PA of tax revenue funds levied by Israel on Palestinian passing imports through Israeli ports. 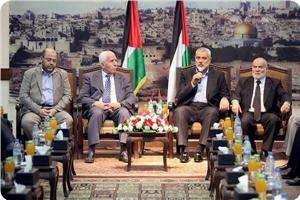 The threats are a pure blackmail intended to bring the PA to its knees. 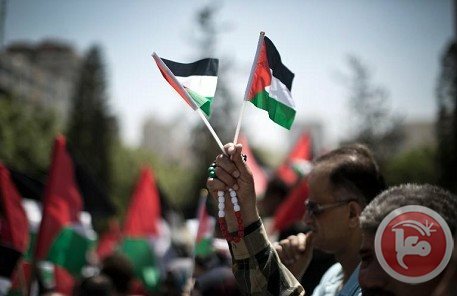 Politically, Israel's ultimate goal is to force the Palestinians to abandon their national aspirations and lower the ceilings of their demands, including giving up on paramount issues such as Jerusalem and the refugees and coming to terms with the Israeli colonization of the West Bank and East Jerusalem. I believe the PA shouldn't feel helpless in the face of these insolent Nazi-like threats coming from the very people who fill the ether with vociferous claims about suffering at the hands of the Nazis. Israel must not be allowed to punish the Germans and avenge the holocaust by tormenting the Palestinians. This is the message we Palestinians must communicate to the entire world. Yes, the time might be late for us, but it is never too late to spread the truth and free the peoples of the world from the big Jewish lie. 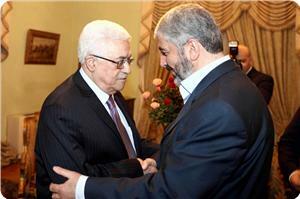 As to the PA, it must immediately stop groveling at Israel's feet. This is more than demeaning to the Palestinian honor and dignity. Instead, the PA should play the trump card of the so-called security coordination with Israel. Security is a paramount matter for the Israelis and any compromise in this regard would immediately unsettle the Israeli political- security establishment. 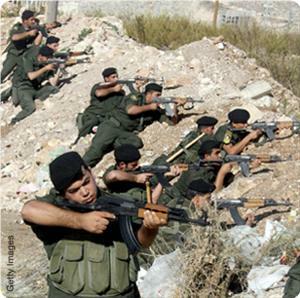 No one expects the PA to wage war on Israel. We know the facts on the ground too well. However, the PA has no excuse for compromising Palestinians' dignity by serving Israeli security interests, even by arresting and persecuting Palestinians, and at the same time receiving a manifestly humiliating treatment by the emulators of Nazism. But is the PA patriotic enough and dignified enough to make a meaningful stand that would allow our people to retain a semblance of national honor? Such a feeling, he added, should touch the conscience of all free people in the world and all advocates of justice and humanity. Vendola added that as long as there are Israeli settlements on the Palestinian land, it will be pointless to talk about peace and negotiations. 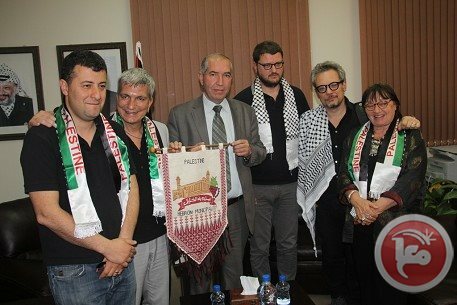 Vendola’s delegation, which met with the mayor of Hebron Dawood al-Zaatari, included lawmakers Arturo Scotto, Gennaro Migliore, Francesco Martone and the Italian consul general in Jerusalem Davide La Cecilia. Former speaker of the Italian parliament Luisa Morgantini was also present at the meeting. The mayor accompanied the delegation in a field visit to the Ibrahimi Mosque and the Old City so they could see firsthand the suffering of the residents at the hands of Israeli troops and settlers who live in the city. Three senior Islamic Jihad leaders traveled from Gaza to Egypt via Rafah crossing on Wednesday, sources within the faction told Ma'an. Khaled Mishaal, the political bureau chairman of Hamas, has called for the formation of a new Palestinian national strategy based on common factors. Mishaal was speaking over the phone to the funeral held in El-Bireh in the West Bank Wednesday afternoon for the bodies of two Qassam Brigades’ martyrs who were restored from Israeli numbered graves after 16 years of their assassination and burial there. 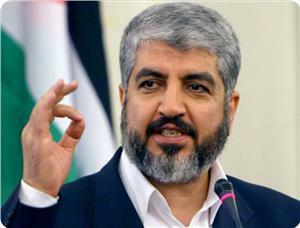 All Palestinian factions should agree on common factors that would preserve national constants and bury the division once and for all, Mishaal said. He said that such a strategy was a must after failure of negotiations, Israel’s intransigence and American indifference. “Our path is resistance to liberate our land, free our prisoners, restore our holy shrines, and return refugees to their homeland,” the Hamas leader emphasized. Mishaal called for building on the new spirit that arose in the Shati Declaration and to complete the path of reconciliation to the end and to unite in confrontation with the occupation. 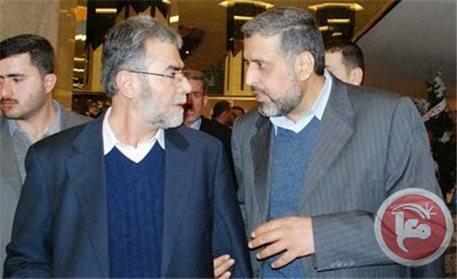 Representative of Hamas movement in Yemen Abdul Muti Zaqout stressed the importance of Palestinian reconciliation, praising the efforts made by Yemen's president and government in support of Palestinian people and cause. 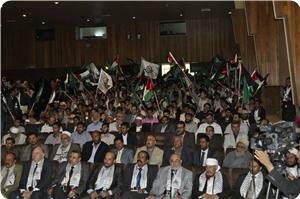 During Palestinian prisoners’ festival held in Sana’a, Zaqout confirmed the importance of Palestinian national reconciliation and partnership between Palestinian factions, stressing the Palestinian adherence to national rights and constants. He said that the prisoners' issue is an essential part of Palestinian cause and steadfastness, pointing to Palestinian factions' keenness on the release of all Palestinian prisoners from Israeli jails. For his part, Sana’a mayor Abdul Kadir Hilal congratulated the Palestinian people for achieving national reconciliation, calling on all Palestinian factions to unite their efforts in face of Israeli occupation. Hilal stressed Yemeni people's support for the Palestinian just cause, congratulating the liberated prisoner Ahlam Tamimi, who was attending the event, for her release from Israeli jails after spending 10 years in Israeli jails. For her part, Tamimi said that although what she has been subjected to in Israeli jails of torture, humiliation, and ill-treatment, she knew very well that the Qassam Brigades, the armed wing of Hamas, will not allow her detention for long. She pointed out that Palestinian prisoners are subjected to different forms of crimes and violations practiced by Israeli prison administrations. Tamimi commended Yemen's supportive position for the Palestinian cause, pointing out that defending the Palestinian cause is an Islamic duty especially in light of Israeli Judaization schemes in al-Aqsa Mosque. Palestinian officials from the West Bank and Gaza took a first step towards implementing the reconciliation agreement signed by Hamas and the Fatah-led PLO a week ago, a committee member said Wednesday. The subcommittee of freedoms was originally conceived of during a Hamas-Fatah reconciliation agreement signed in Cairo in 2010, he added. The U.S. has warned the Palestinian Authority (PA) of projected aid freeze if they follow through with decisions to form a unity government comprising Hamas members. “No US governmental money will go into any government that includes Hamas,” Assistant Secretary for the Near East Anne Patterson told a House hearing last night. “Until Hamas accepts the Quartet conditions, and that's renouncing violence, recognizing previous agreements and, above all, recognizing Israel's right to exist, no aid shall be provided to a Hamas-run government,” Patterson further maintained. For his part Rep. Ted Deutch told the hearing into the budget priorities for the Middle East and North Africa: “No Palestinian government that includes terrorist members of Hamas will receive US funding." Subcommittee chairwoman Ileana Ros-Lehtinen said the Palestinian reconciliation deal had "major implications" for the fiscal year 2015 budget, which begins in October. The warnings come at a time when PLO and Hamas reconciliation delegations agree to turn the division chapter and form a consensus government to catch up on long years of unproductive contention. But the move has been denounced by Israeli Occupation Authorities (IOA), which has imposed tough sanctions on the PA and cancelled its participation in the peace talks. Hamas has been pigeonholed under the so-called Terrorism List since 1993 by the U.S administration which, quite observably, has been cheesed off by Hamas-Fatah reconciliation process. Hamas movement denied it was going to participate in the next Palestinian presidential elections , adding that the issue was still under consideration. Hamas corrected on Tuesday a statement attributed to its political bureau member Khalil al-Hayya in which he said that his movement was going to participate in the presidential elections. 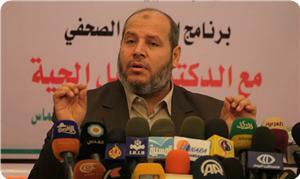 The movement said that Hayya said Hamas was studying the option of participating in the presidential elections.